Bryan’s Review of ‘Dark Shadows’!!! The Dukes of Hazzard, The Addams Family, and the A-Team are all television shows that have become feature films over the past several years. The latest television show to be remade on the big screen is the 60’s television series, Dark Shadows. With its dark humor, strange characters, and gothic set pieces, how could off-beat director Tim Burton resist? Unfortunately, Dark Shadows proves yet again that even though you have an expansive budget, amazing set pieces, and good actors, you don’t necessarily get a quality film. 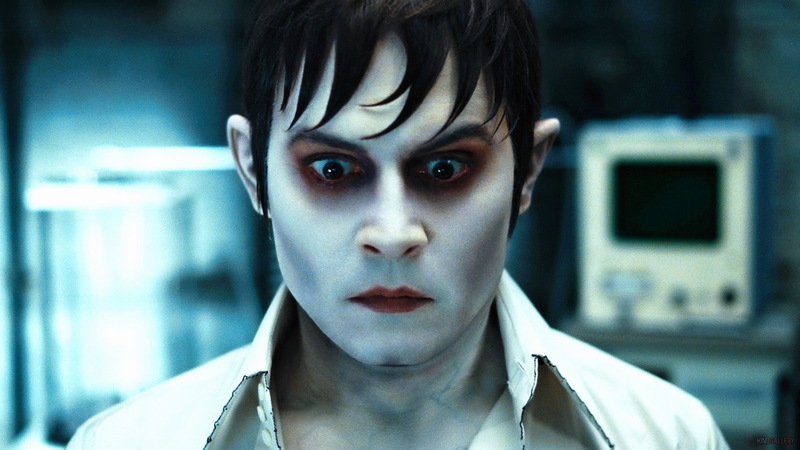 Dark Shadows fails to humanize any of the characters besides Barnabas Collins (Johnny Depp), and although it started off as a fun quirky film, it never improved or advanced after the first ten minutes. Dark Shadows is the story of a man from a wealthy family, who is turned into a vampire by a witch and then buried for two centuries. When he is unearthed in 1972, we see Barnabas acclimate to modern day conveniences, reconnect with his descendents, fix-up the estate, rebuild the declining family business, seek revenge against the witch, feed on the living, and (of course) find true love. This movie had so much potential, but Burton and writer Seth Grahame Smith failed to focus on any character in the film other than Barnabas. No matter how good some of the acting might have been, one cannot identify with a character if their screen time and back-story only last a few minutes out of the entire film. There are some deeply sad events that these characters endure, but with the lackluster script, dead-pan acting, and lack of character screen time, the actors (other than Depp) had no hope of making their characters any more than one-dimensional and uninteresting. I didn’t care what happened to anyone in the film at any time. There was even a big surprise we learn about one of the characters during the last fight scene of the movie, but this reveal couldn’t have been any more out of place due to the poorly executed production. And while I’m complaining – Barnabas’s revenge against the witch should have been the most interesting aspect of the movie. Instead, the drab back-and-forth between the two left me feeling mere ambivalence. And all I can say is that I’m glad that the equally banal anti-climactic showdown was loud–otherwise I would have fallen asleep. There are, however, a few things I did enjoy about Dark Shadows. I loved the music in the film. Elfman’s score was brilliant (as always), and the soundtrack was brimming with classic 60’s and 70’s tunes. Depp, Moretz, and Bonham Carter’s performances were all very good. Depp’s performance in the first ten minutes of the film was hysterical as we watched Barnabas discover paved roads, television, motor vehicles, and rock music. And the set pieces are that famous Burton-gothic set design with creepy trees and old creaky houses. It was all beautifully done, even though it was mostly CG. I was really hoping Dark Shadows was going to be great. It had the potential to be great, but ultimately didn’t hold my attention past the first ten minutes and never regained its momentum. If writer Seth Grahame Smith does this sort of job with the upcoming Abraham Lincoln Vampire Hunter film, or the Beetlejuice sequel, then I will be wholly disappointed. If you’re looking for a movie to watch this weekend, go see The Avengers or watch The Sound of My Voice. Dark Shadows is a Netflix rental at best. 4k UHD Review: ‘Pirates of the Caribbean: Dead Men Tell No Tales’! This entry was posted on Wednesday, May 9th, 2012 at 5:35 pm	and is filed under Film, News. You can follow any responses to this entry through the RSS 2.0 feed. You can skip to the end and leave a response. Pinging is currently not allowed. « Tom Hanks Headed to the Broadway Stage!!! I don't know Karate but I do know crazy, and I will use it.